Luxurious 12 page booklet created by former 4AD designer Timothy O’Donnell features exclusive Orphée Prose by Neil Gaiman (of The Sandman fame)! Grief-stricken, Orphée descends into the underworld. 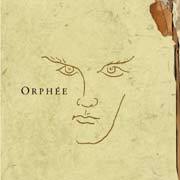 Incapable of following any path but the one his heart lays before him, Orphée descends with a song on his lips. Lost within thoughts of pain, sorrow and longing, he seeks an audience with Hades to beg the return of his wife ~ his lost muse. “Those who go beneath the surface,” Oscar Wilde once reflected, “do so at their own peril.” Yet Orphée’s descent is a journey into his secretive and well-guarded inner soul; for with his tender song, he hopes no less than to win the devil over. His song, of the most subtle and delicate nature, unearths the inspiration deep within. Projekt’s newest compilation explores the ethereal nature of the male voice. Bringing together an impressive array of well-known artists, Orphée venerates the sensitive, introspective inner soul of the singer and the song. Orphee was mentioned in the December issue of the English music mag “Q”.